For other uses, see Antipas (disambiguation). Many Christian traditions, according to the Commentary on the Apocalypse of Andreas of Caesarea, believe Saint Antipas to be the Antipas referred to in the Book of Revelation, Revelation 2:13, as the verse says: "I know thy works, and where thou dwellest, even where Satan's seat is: and thou holdest fast my name, and hast not denied my faith, even in those days wherein Antipas was my faithful martyr, who was slain among you, where Satan dwelleth." The "faithful martyr" of Pergamon, "where Satan dwelleth". According to Christian tradition, John the Apostle ordained Antipas as bishop of Pergamon during the reign of the Roman emperor Domitian. The traditional account goes on to say Antipas was martyred during the reign of Nero (54-68), by burning in a brazen bull-shaped altar for casting out demons worshiped by the local population. There is a tradition of oil ("manna of the saints") being secreted from the relics of Saint Antipas. Saint Antipas is invoked for relief from toothache, and diseases of the teeth. On the calendars of Eastern Christianity, the feast day of Antipas is April 11. 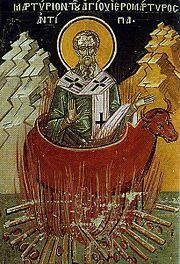 ^ "St Antipas of Pergamon". Retrieved 2007-12-21. ^ James, M. R. (1898). "Antipas". In James Hastings (ed.). A Dictionary of the Bible. I. p. 107. According to one form of his Acts (quoted by the Bollandists from a Synoxarion), he prayed that those suffering from toothache might be relieved at his tomb. ^ From "Oil of Saints" in Catholic Encyclopedia: "Following is a list of other saints from whose relics or sepulchres oil is said to have flowed at certain times: 1) St. Antipas, Bishop of Pergamum, martyred under Emperor Domitian ("Acta SS.," April, II, 4)." Retrieved January 18, 2007. Wikimedia Commons has media related to Antipas of Pergamum. This page was last edited on 21 January 2019, at 13:02 (UTC).